This dialog box selects the default tool used when files are dragged and dropped onto the Drag and Drop Window. This allows quick processing of multiple documents and simulates the functionality of old versions of CSE HTML Validator. 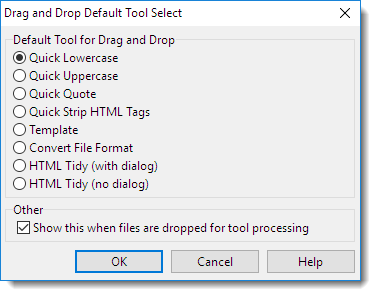 This dialog box has an effect only if Drag and Drop->Use Selected Tool on Dropped Files is checked. Use the radio buttons to select the tool to use when files are dropped onto the Drag and Drop Window and Drag and Drop->Use Selected Tool on Dropped Files is checked. Only one tool at a time may be used. •Show this when files are dropped for tool processing - If this box is checked and Use Selected Tool on Dropped Files is checked, then every time one or more files are dropped onto the Drag and Drop Window, the Drag and Drop Default Tool Select dialog box will appear to remind you that you will be using a tool on the dropped files, as well as to confirm that you want to perform tool processing with the selected tool. If you do not want this reminder and confirmation to appear, then you can disable the dialog box from appearing when you drag and drop files by unchecking this option. To enable the dialog box after disabling it, select Drag and Drop->Drag and Drop Options and recheck this option.